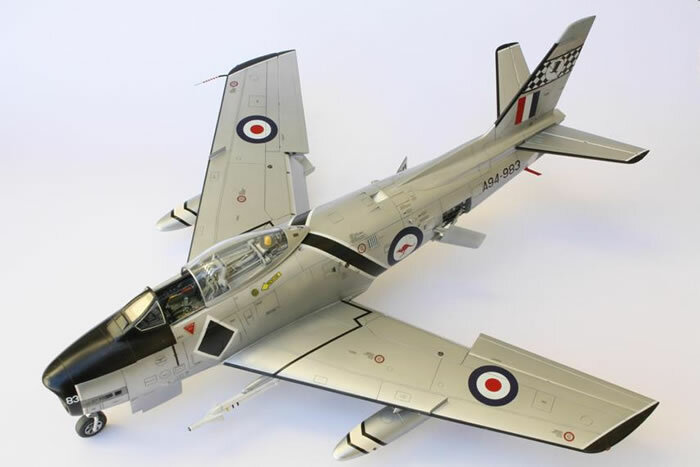 The Commonwealth Aircraft Corporation (CAC) Sabre differed significantly from the original design produced North American Aviation. 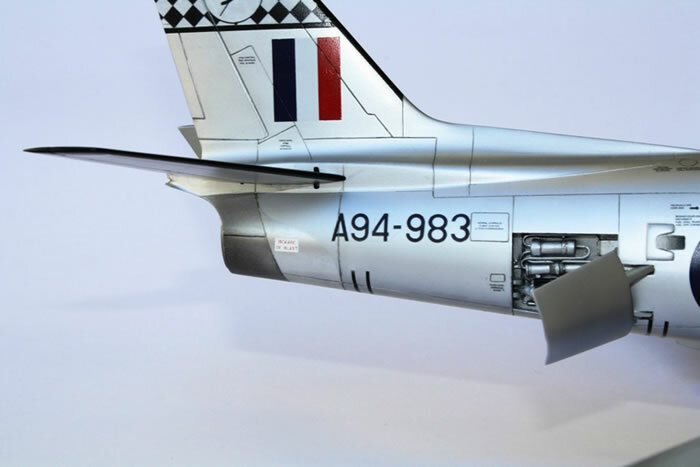 Based upon the F-86 E, the CAC Sabre incorporated numerous changes, the most significant being use of the Rolls Royce Avon 26 jet engine, which necessitated a larger air intake to cater for its greater power, and positioning the engine further aft to maintain the aircraft’s centre of balance despite the engine’s lighter weight. 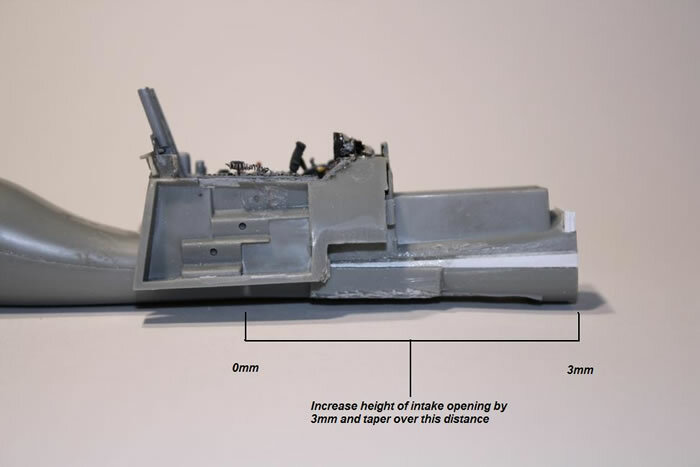 CAC also upgraded the fixed armament from 6 x .50cal machine guns to 2 x 30mm ADEN cannons. 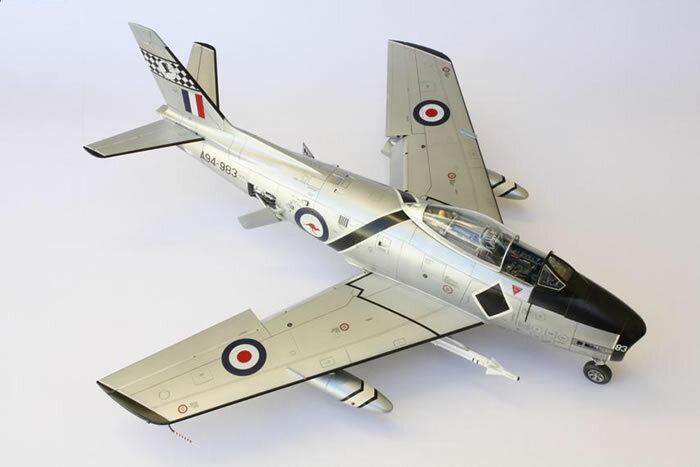 Sabres served with the Royal Australian Air Force (RAAF) from 1956 to 1971 in three versions; the Mk 30, 31 and 32. 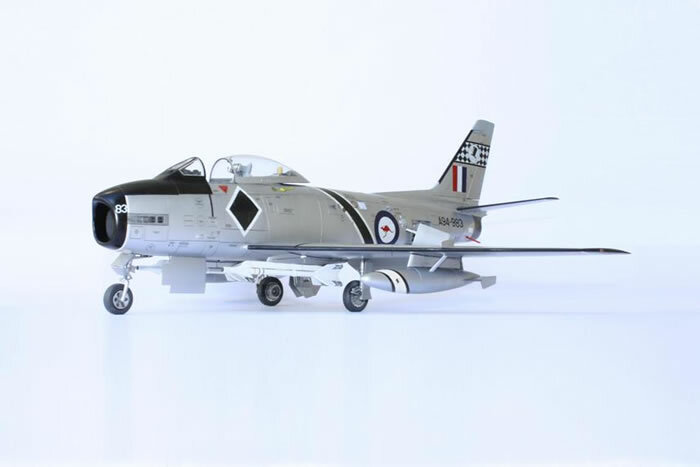 Between 1969 and late 1971 the RAAF donated 16 Sabres to the Royal Malaysian Air Force (RMAF). A94-983 was one of the aircraft donated in 1971, serving as FM983. 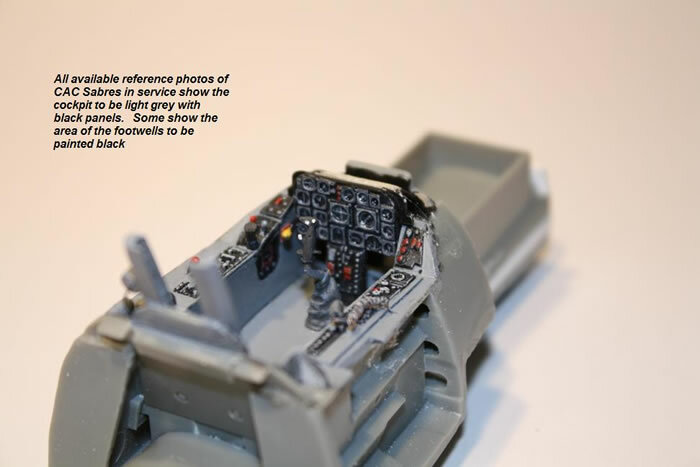 However by 1976 the Sabres were being retired from Malaysian service as well. 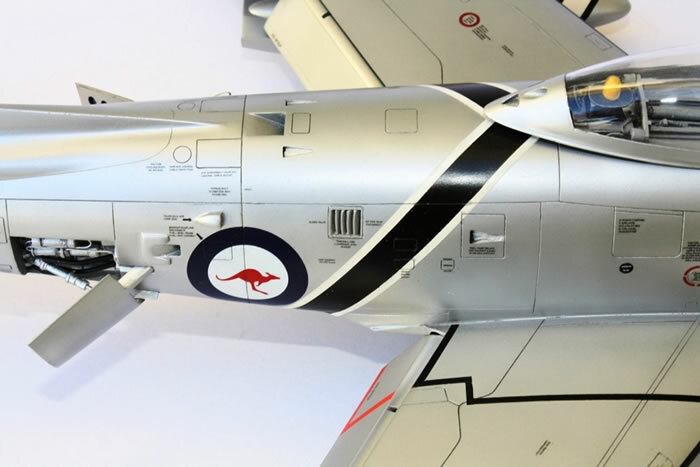 Hearing this, the Officer Commanding 75 Sqn RAAF, then based in Malaysia and operating Mirages, approached the RMAF and was successful in securing a former Australian Sabre for restoration by squadron volunteers. After a two year restoration FM983 flew again in July 1978, after which it was formally handed over by the RMAF. 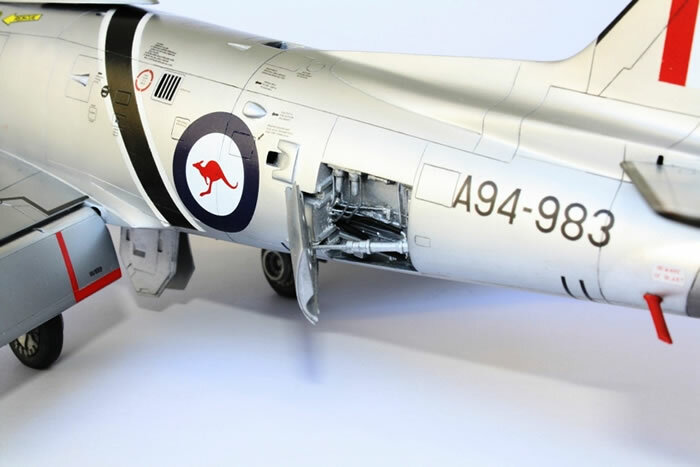 Thus began a second chapter in the life of A94-983, which has seen the aircraft restored twice more, most recently returning to the air in July 2009. 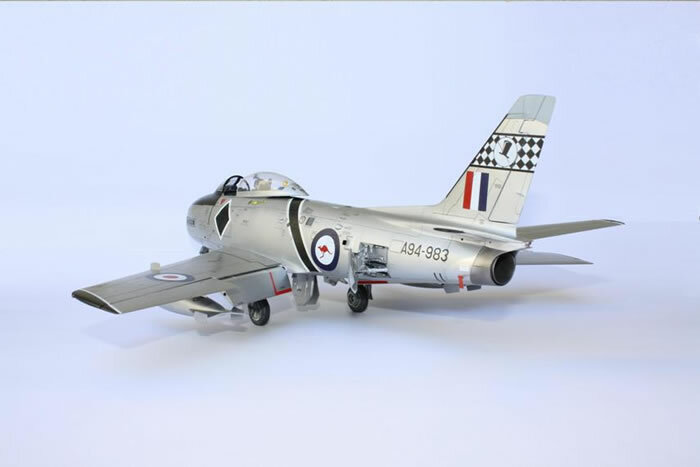 The aircraft remains owned by the RAAF Museum but is now operated on their behalf by the Temora Aviation Museum. 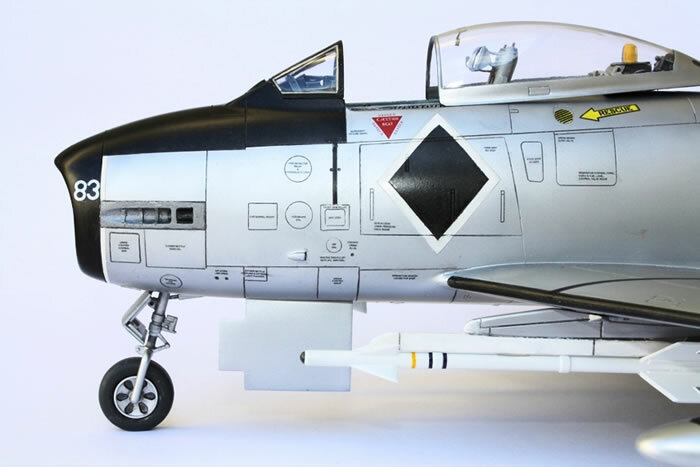 This model has drawn upon the best of two kits – the venerable Hasegawa version of the F-86 F and the much more recent Kinetic / Italeri F-86 E offering. 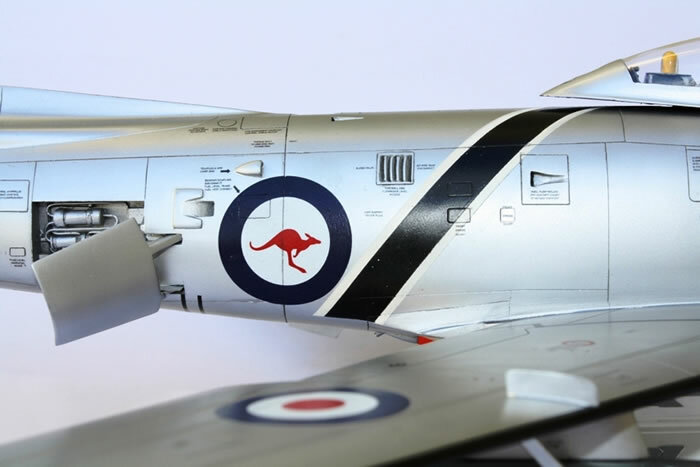 Both have their good and bad points and with a little work, both will make up into a reasonable likeness of their respective originals, though producing the Australian CAC Sabre takes a little extra effort. The complexities of ‘Australianising’ the model are shown on the construction photos that accompany this article. But first, why use two kits? 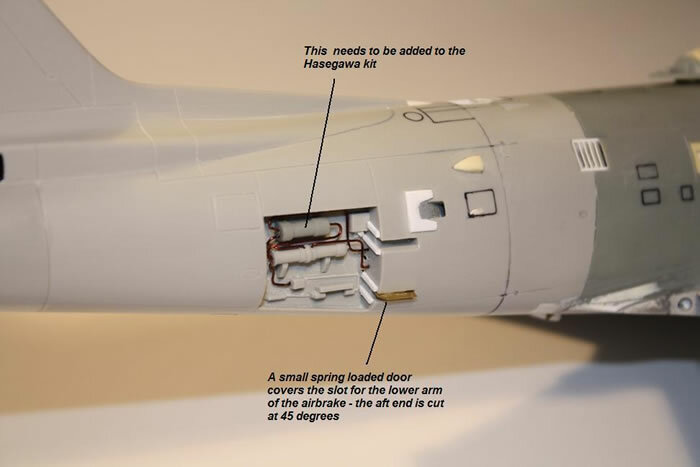 Well, I bought the Hasegawa one on sale a few years ago, but then found I didn’t have the skills to engrave all the panel lines (I’ve had practice now). 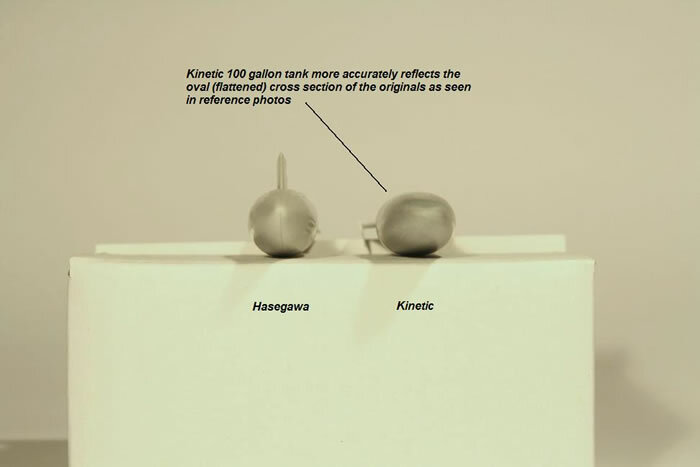 I then bought a Kinetic one that, on closer examination, looked like more work than the Hasegawa one already in the stash. So, in the end, I combined the best of both. Mixture of engraved and raised panel lines. 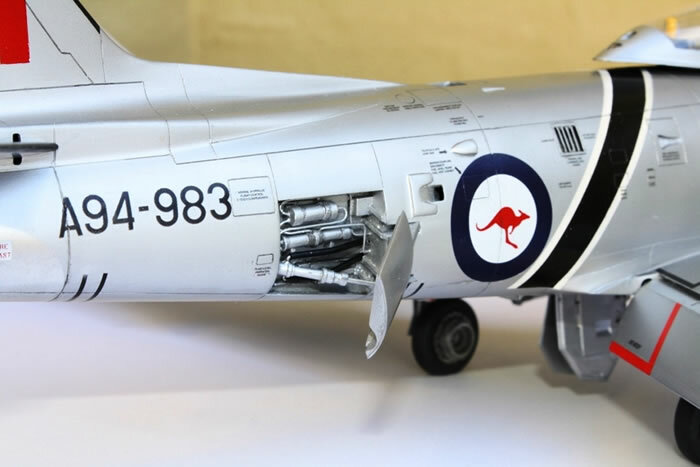 Smooth surface (panel lines, and particularly rivets, were virtually invisible on painted Sabres) requires scribing, but making an Aussie Sabre requires filling and relocating several panel lines anyway. 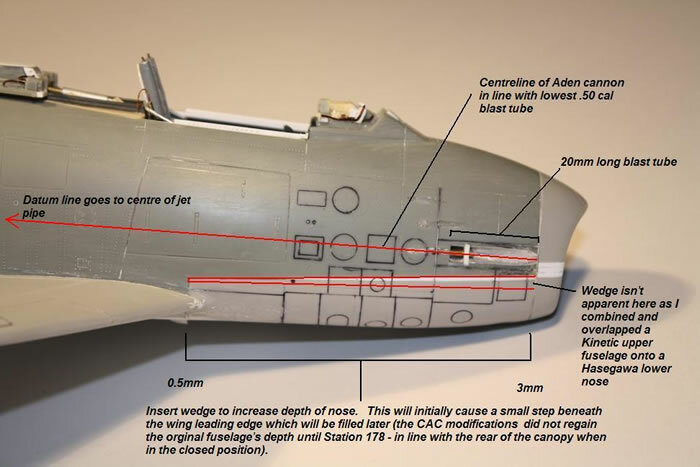 Heavy but inconsistent engraving (occasionally softens to nothing on top and bottom of fuselage), plus rivets and stressed skin effect. 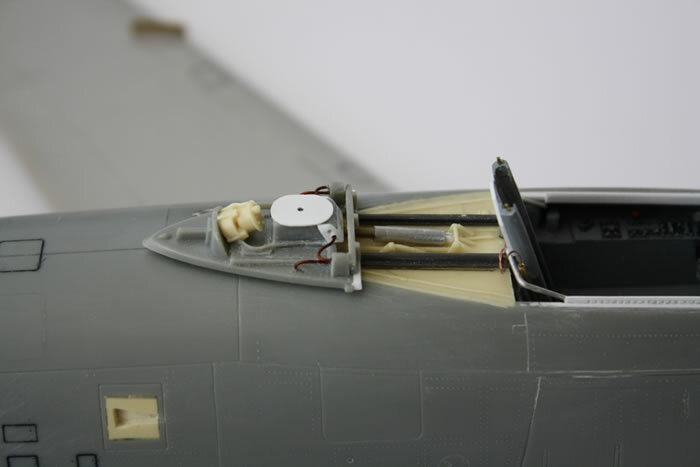 Some sink marks on wings and fuselage require filling then restoring the stressed skin effects and re-riveting. 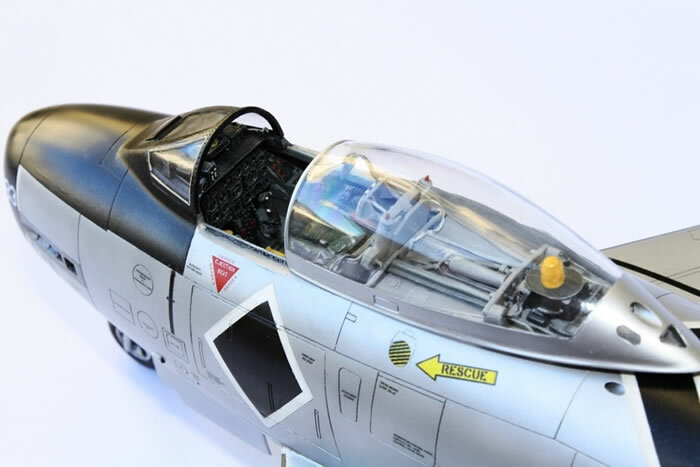 Upper forward fuselage has poor shape – the cockpit is about 2mm too narrow, particularly around the windscreen frame. Good shape in this area, but the gun blast tubes are very crude. 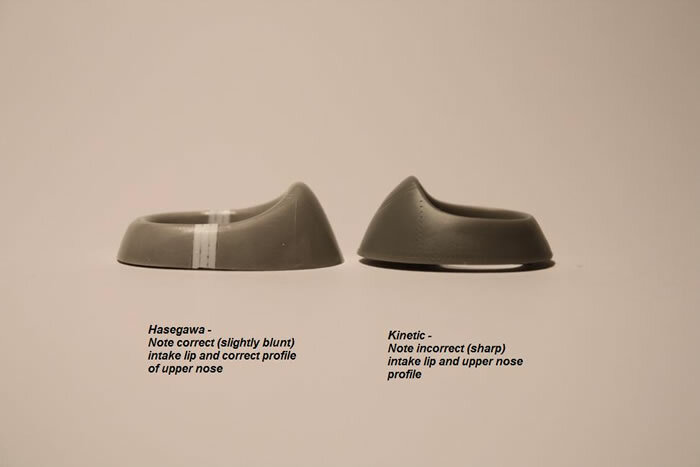 Nose intake ring has good shape. 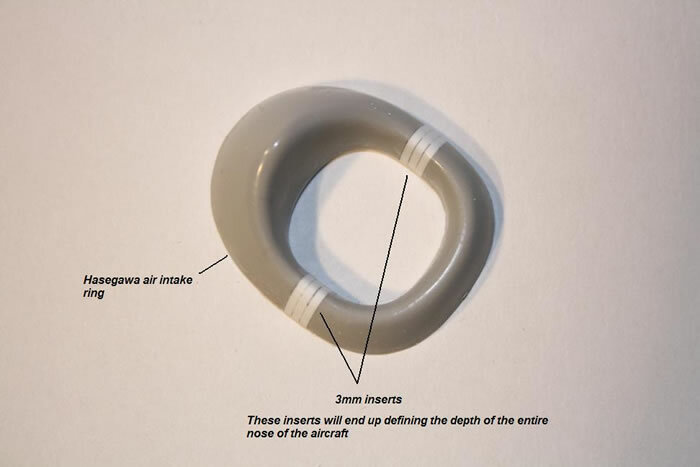 Very poor nose ring shape, but shape of base is the same on both kits so the ring can be swapped. 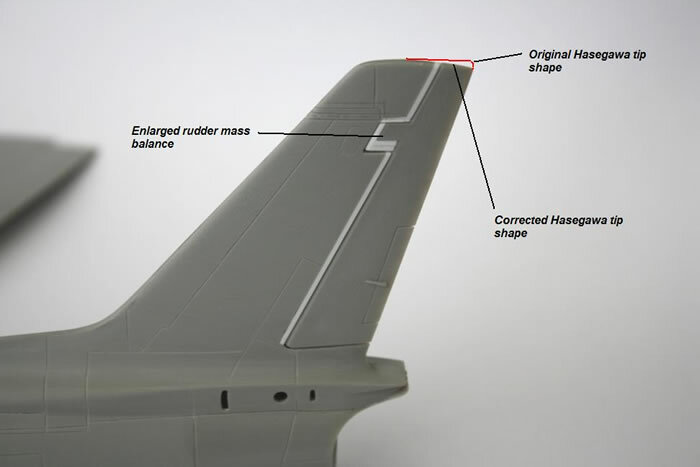 Lower forward fuselage has good shape – it leads into a single smooth curve beneath the wings. 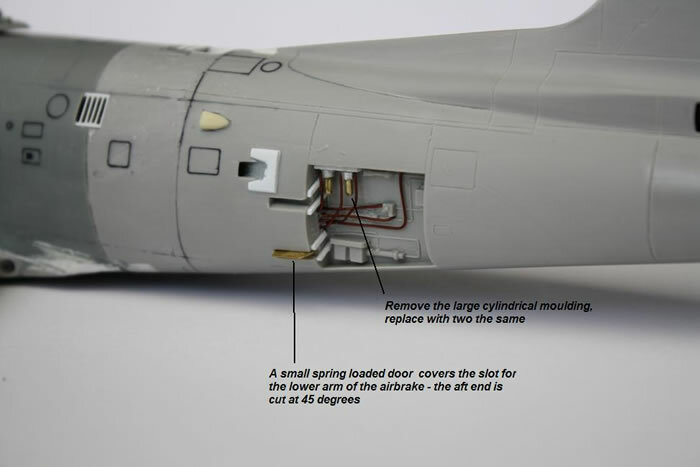 Lower forward fuselage has poor shape – it is too curved and leads into a secondary bulge beneath the wings. 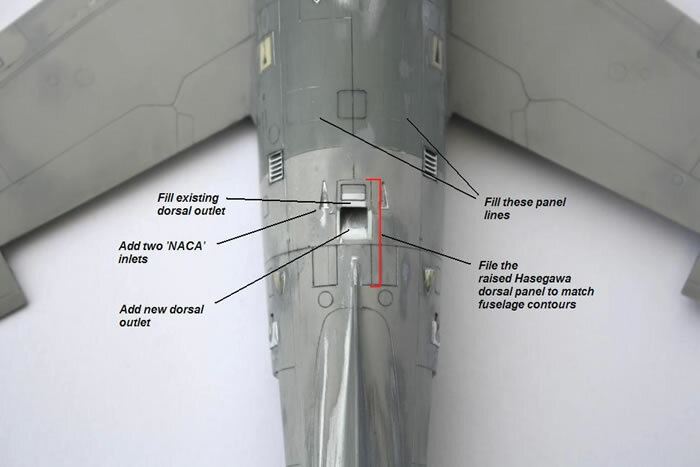 Ignore it or fill heavily beneath the wing root leading edges to make the area between the nose and main wheel wells deeper and part of one continuous curve. 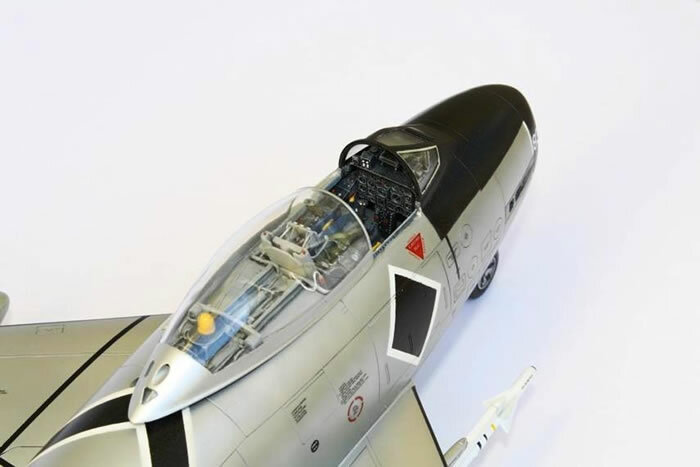 Rear fuselage has good shape with sharp moulding for the dorsal spine, around the airbrakes and jet pipe. 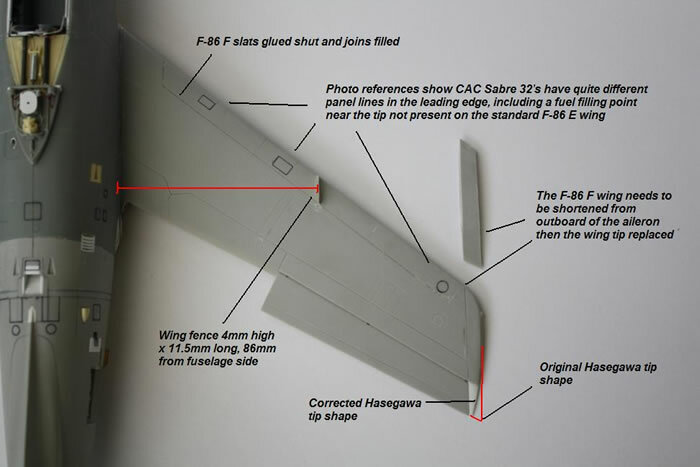 Rear fuselage has poor shape with a very wide and rounded dorsal spine and a very thick fin and rudder. 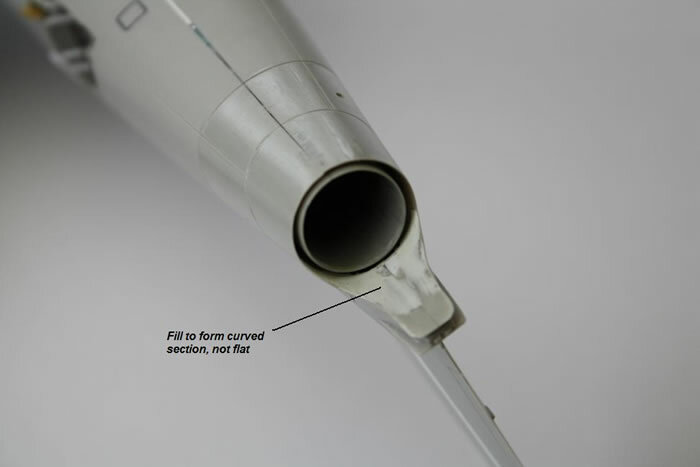 Jet pipe and rear fuselage opening require extensive thinning. Wings are thin and of generally good shape (but are long span slatted wings). 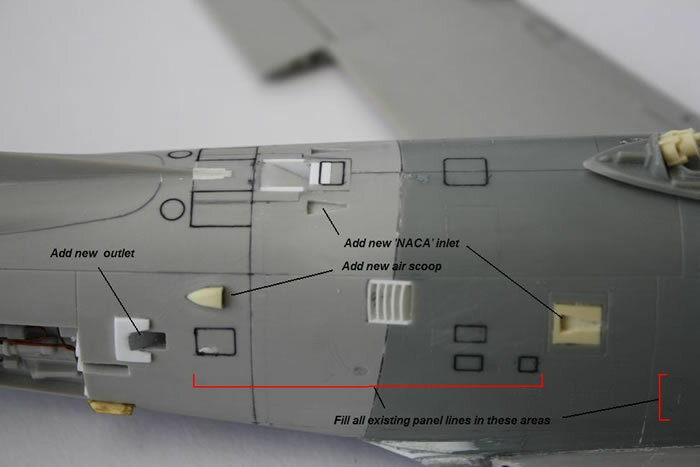 Wing tips need reshaping to sharpen the trailing edges. 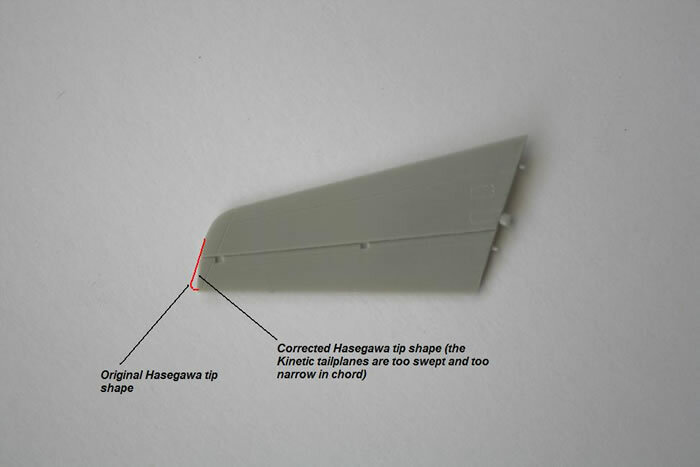 Mainplanes have correct dihedral (flat on top), while tailplanes are thin and of correct sweep and chord. Wings are thick and very heavily engraved. 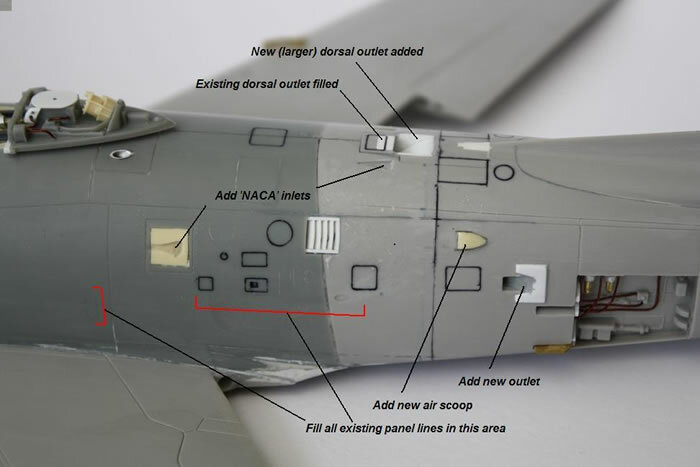 Several panel lines do not match CAC Sabre wings so must be filled and rescribed. Mainplanes have anhedral (they droop), while tailplanes are too thick, too swept and too narrow in chord. 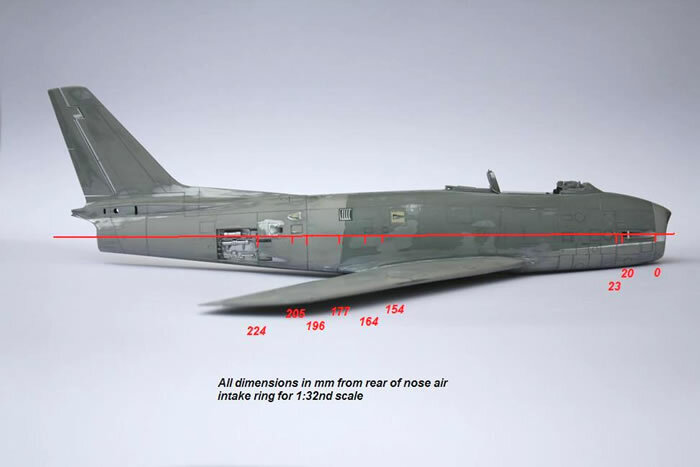 There is a pronounced bulge in the shape of the lower fuselage beneath the wings that would be very difficult to correct. 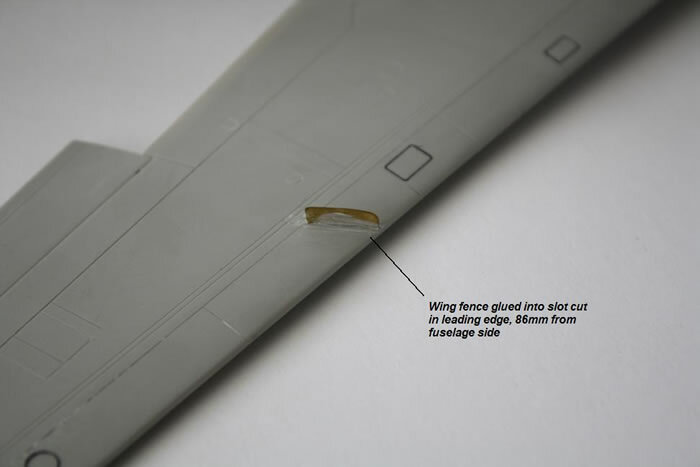 Underwing stores and pylons are of poor shape. 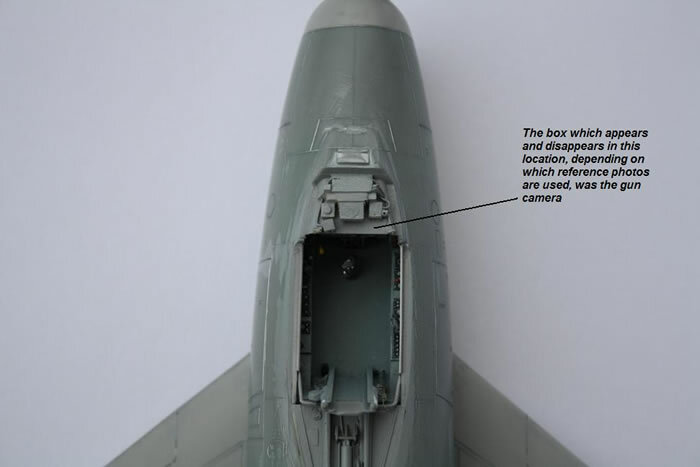 Underwing stores and pylons are good. 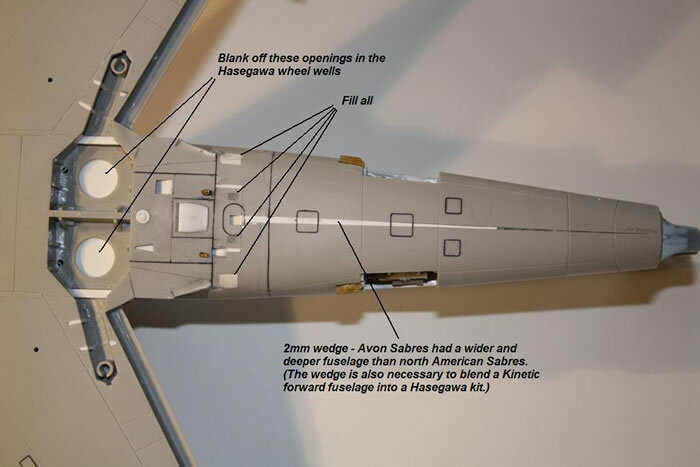 In summary, the Hasegawa offering has much better shape, except around the cockpit canopy. 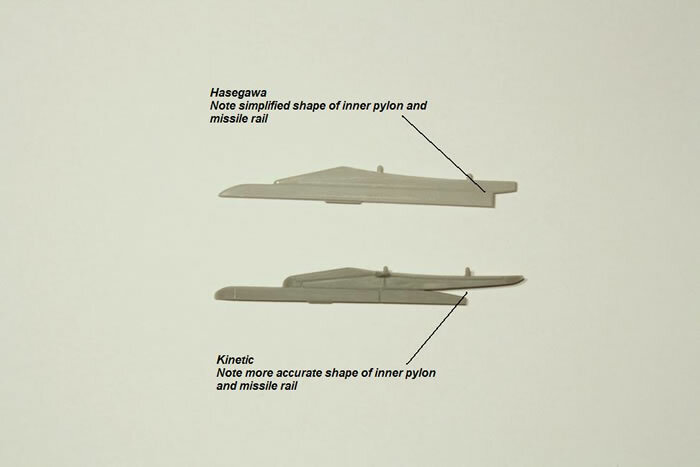 So, this build combined the forward upper fuselage of the Kinetic kit with what was otherwise a Hasegawa kit. 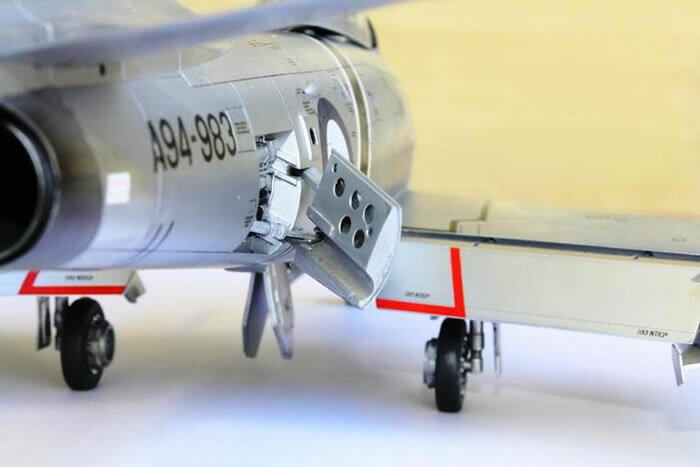 The Hasegawa rear fuselage mates almost perfectly with the Kinetic forward fuselage, needing only a small sliver of scrap plastic to fill the lower seam under the rear fuselage. 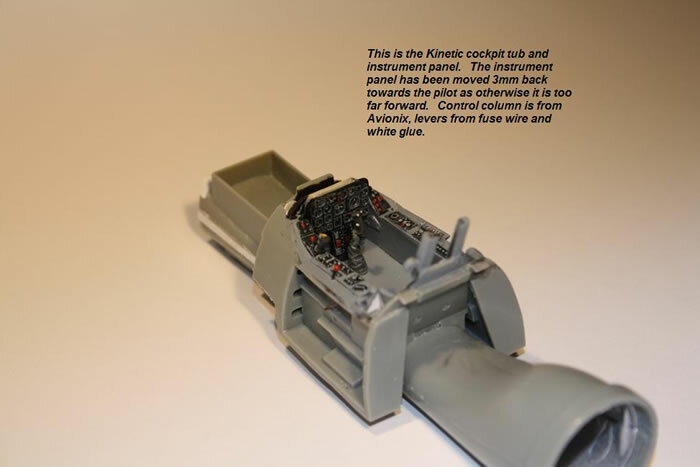 Pylons and drop tanks were also taken from the Kinetic kit. 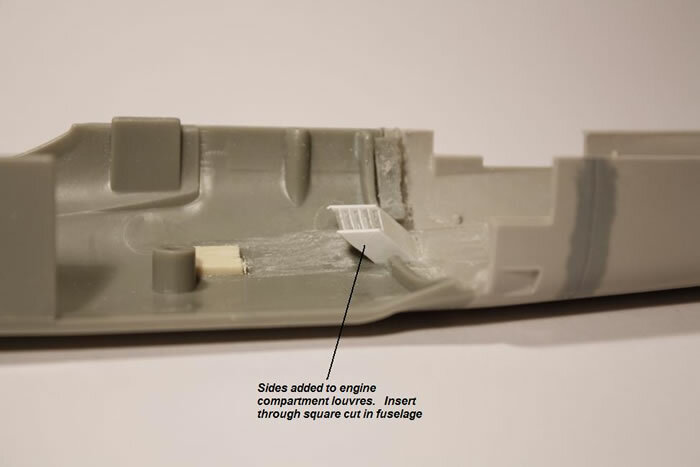 The only aftermarket items used were a resin seat from Avionix along with the control column and a few parts for the area behind the seat. 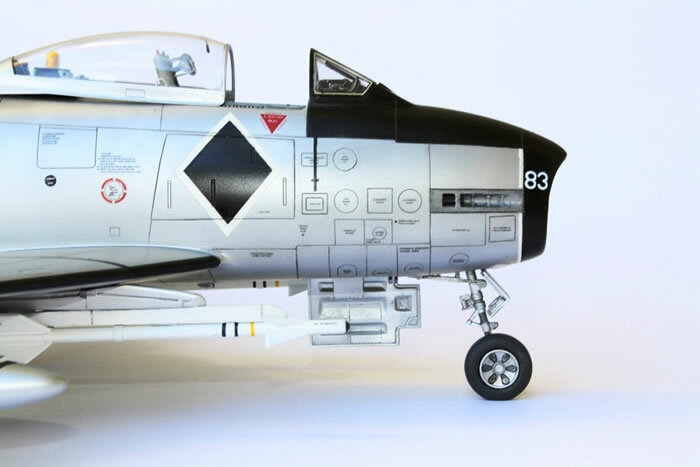 Everything else was scratch built or modified. 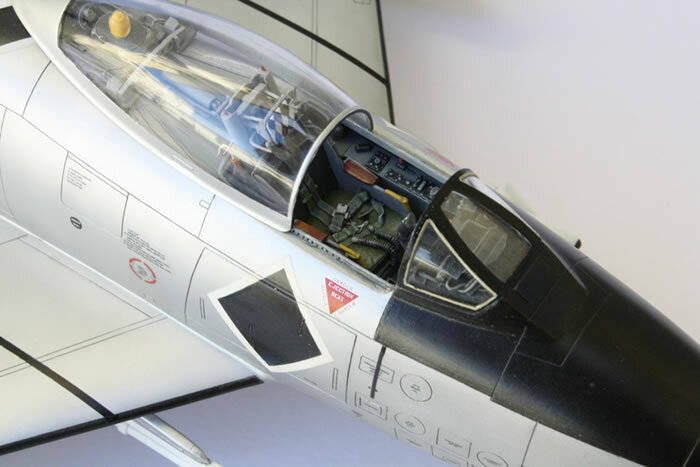 The 37 construction photos in the thumbnail gallery below show all the steps taken both to combine the two kits and convert the result into a CAC Sabre. 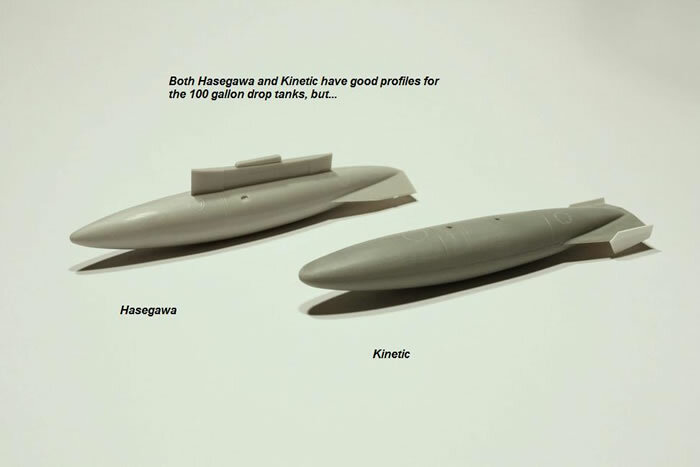 In the photos the darker plastic comes from the Kinetic kit, while the lighter plastic comes from the Hasegawa kit. 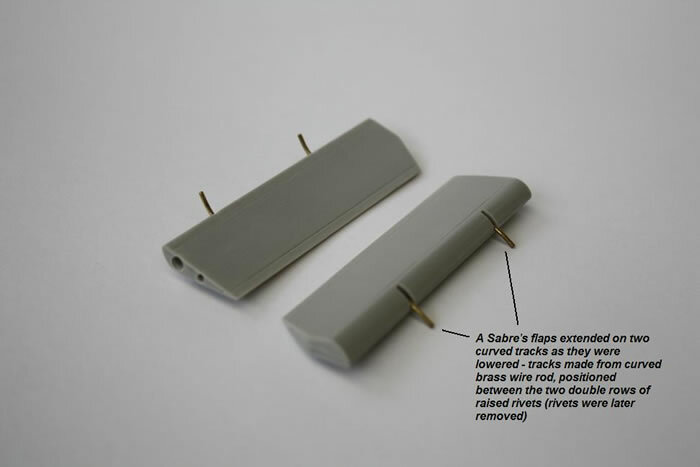 When engraving, it’s always worth using either a scribing template or Dymo labelling tape. 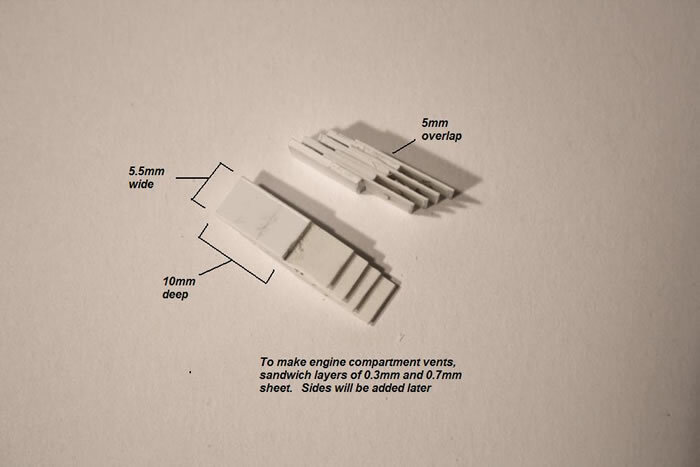 If necessary, make templates from thin plastic card. 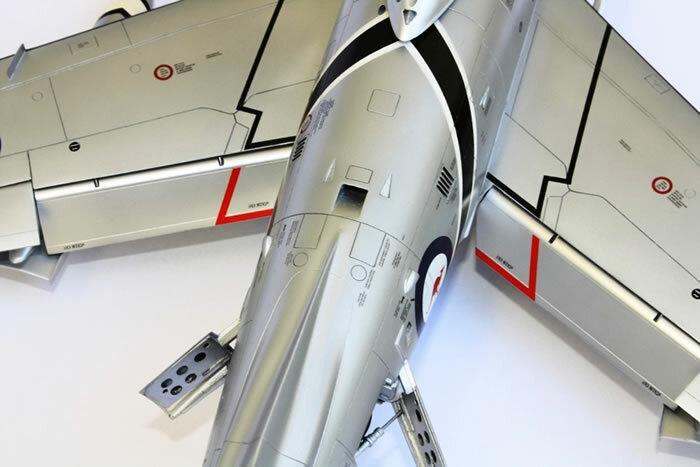 Once you have finished engraving, run a marking pen along the new lines then sand it off the outer surface. 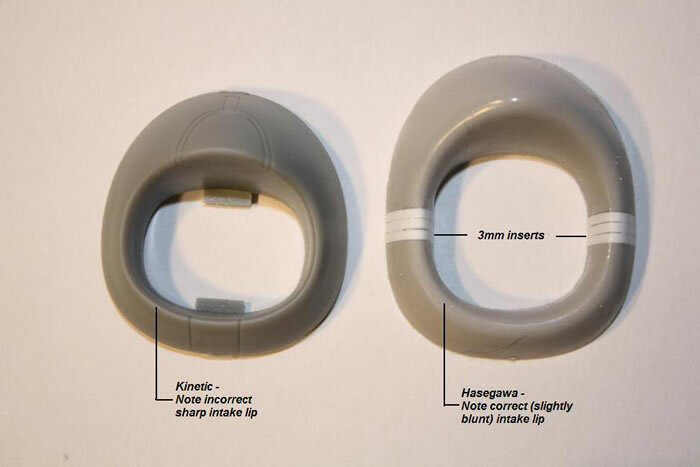 The marking pen will remain in the engraved line and, more importantly, will show up all the slips and scratches that might need to be fixed. 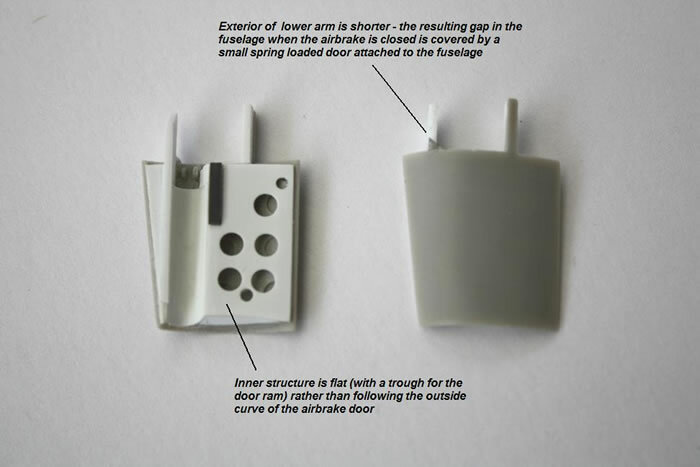 For this, I use superglue applied with a pin inserted in the end of an old paint brush handle. 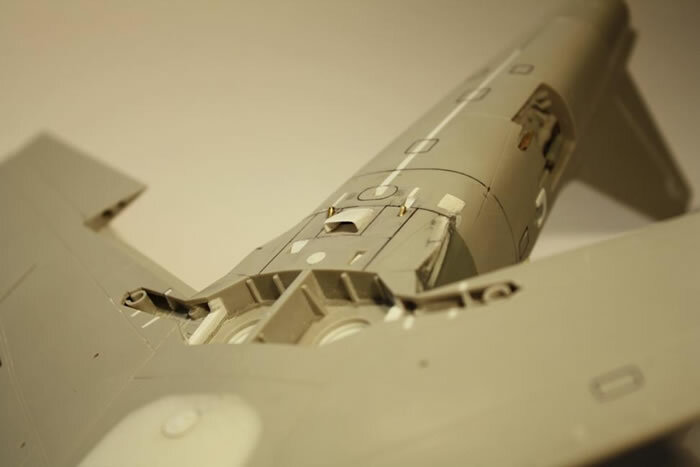 While preparing the surface for painting took several goes to remove all the scratches in readiness for a silver finish (see above), the fact that Australian Sabres were painted made things much simpler than if they were bare metal. 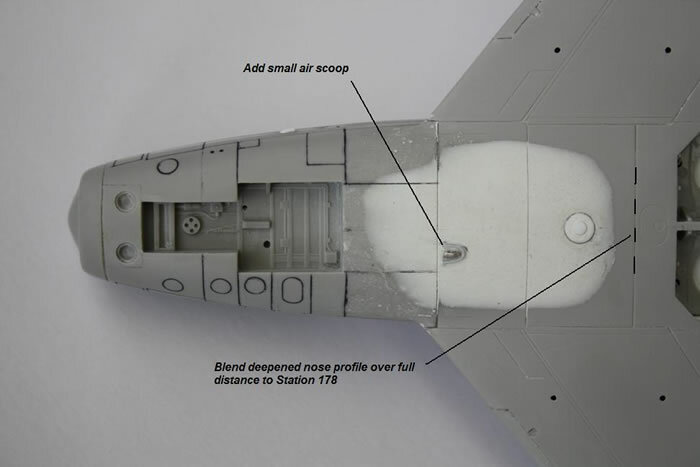 To paint the model Tamiya rattle-can Silverleaf was used, decanted into a bottle then sprayed through the airbrush. 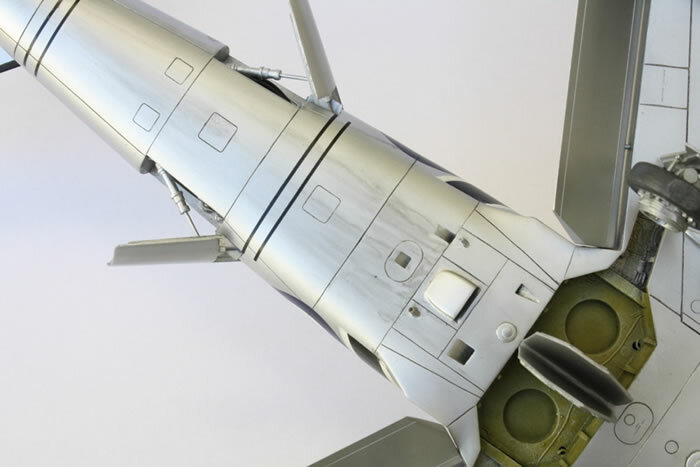 Testors Modelmaster Metaliser Sealer was used for the clear finish. 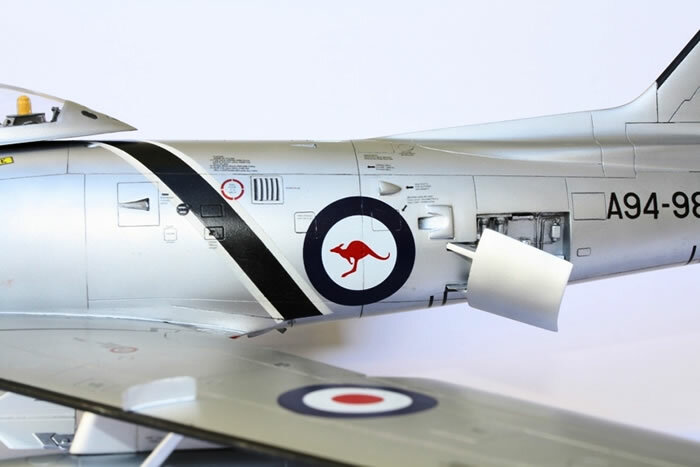 Generic Australian markings came from Aussie Decals, while the specific aircraft markings and stencilling came from Southern Sky Models. 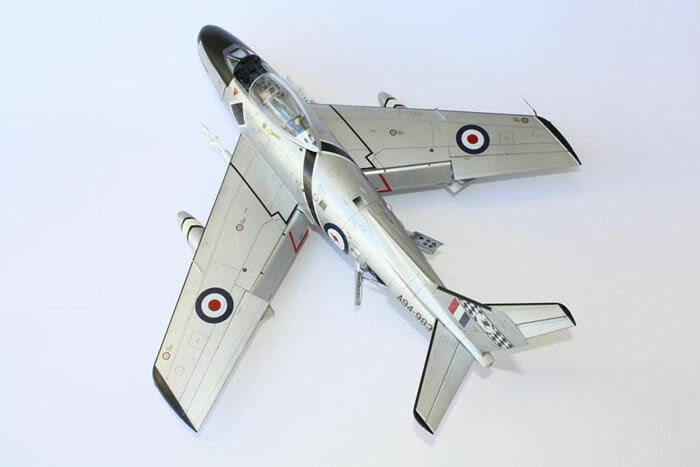 These cover all of the aircraft’s three slightly different schemes since first being restored in 1978. 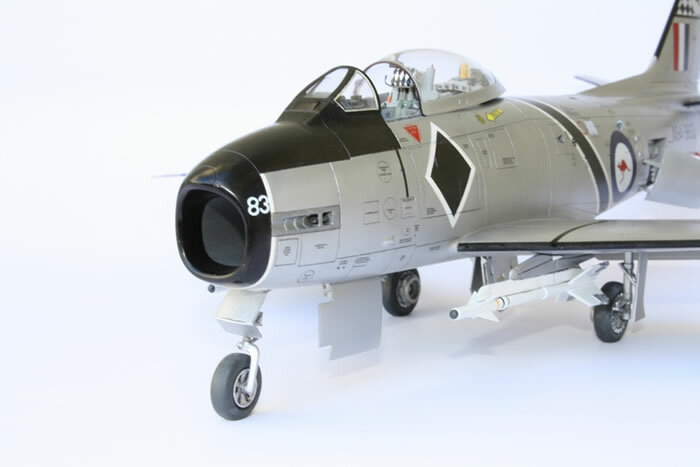 This was a deceptively complex build as there are numerous small differences between a CAC Sabre and the original North American F-86. 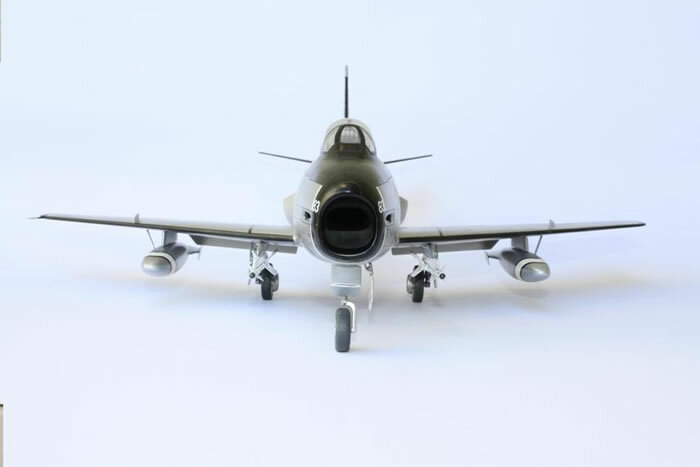 Additionally, no single manufacturer has yet produced the definitive model of an F-86, while capturing the elusive shape of the CAC Sabre’s nose takes more work than first appearances might indicate. 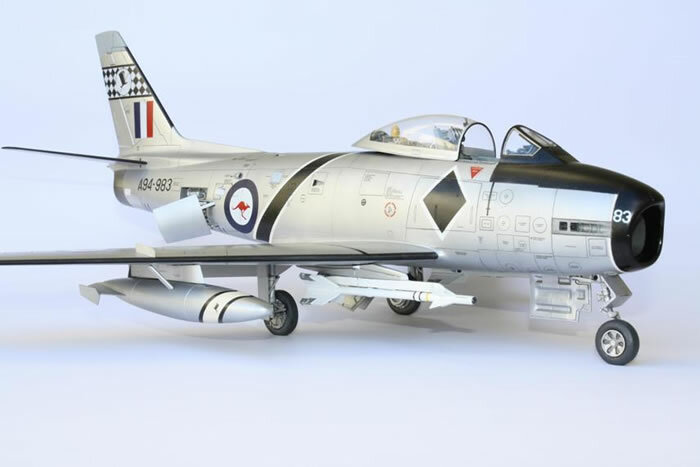 Still, there aren’t many people who have a 1/32nd scale CAC Sabre on their shelves, so it’s simply a question of, how much do you want one?